Pakistan Awami Tehreek (PAT) chief Dr Tahirul Qadri left Pakistan early on Tuesday to “reorganise his party overseas”. 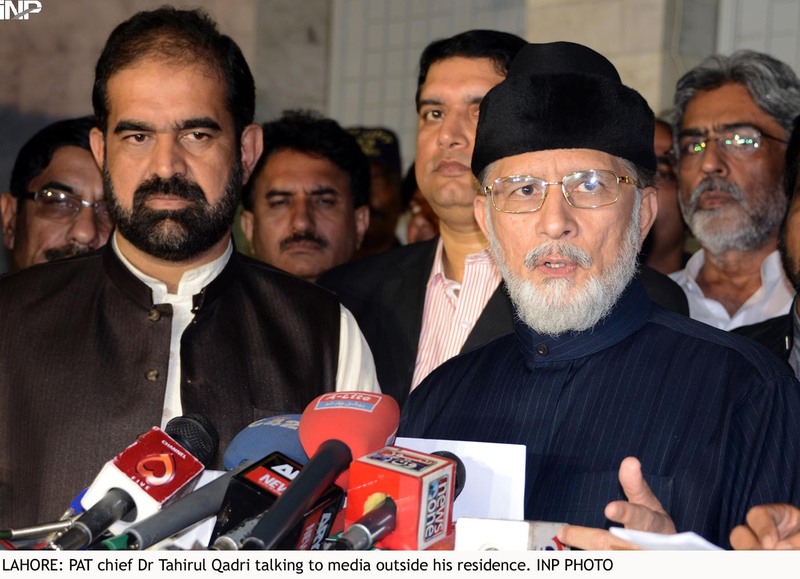 Talking to reporters at his residence on Monday evening, Qadri said that he was leaving the country on an Emirates Airlines flight at 3.30am early Tuesday. He said that he would fly to the US and then move to Canada on Nov 23. “After a three-day stay in Canada, I will return to Pakistan,” he said, adding that he had launched a political struggle to bring about a revolution through the power of vote. He said PAT’s strength was his workers who lived in foreign countries. “PAT was dissolved in 2004, and we will reorganise it again,” he said. He said PAT had entered the political arena to play the role of a real opposition, adding that a schedule of protests and sit-ins had already been announced and “we will resume our protests after Muharram”..
“Reshuffling in the federal cabinet is a result of our struggle of over 70 days in Islamabad,” he claimed. The PAT chief censured the incumbent government, claiming that the United Kingdom was a “real democracy” as it did not subject the protesters of ‘Kashmir Million March’ in London to police brutality or blockades. Qadri added that since there were reports of Punjab Chief Minister Shahbaz Sharif leaving for London, he had changed his schedule. He also claimed that he would pay Rs 50 million to any person who could present a signed agreement between him and the government for ending the sit-in in the federal capital. MAY ALLAH SEND THEM TO HELL SOON ..
quadrisc8m..traitor..kaafir..firangigulam ..MAD BAD SHIATAN .. GET YOUR HEAD EXAMINED FOR SANITY ..
old saying -DOG IS DOG ALWAYS RUNNING TO ANYONE FOR BONES .. IF YOU ARE FED UP OF CORRUPTION AND SYSTEMATIC BACKWARDNESS OF YOUR POLITICAL SYSTEM YOU COULD NOT HAVE DONE MORE THAN WHAT QADRI HAS DONE! I HAVE TO ACCEPT THAT HE HAS DONE WHAT WAS HUMANLY POSSIBLE TO CHALLENGE AND BRING DOWN THIS SYSTEM! YOU JUST CANNOT DO MORE THAN THIS ESPECIALLY WHEN YOU DON'T HAVE THE BACKING OF AGENCIES, ARMY, INTERNATIONAL POWERS AND STATUS QUO FACTIONS FROM WITHIN THE SYSTEM! I COMMEND HIM FOR HIS STRUGGLE HE TOOK IT TO THE CLIMAX AND AS SOON AS IT STARTED TO BECOME STAGNANT HE DEFUSED IT TO START AGAIN THROUGH A DIFFERENT AVENUE! HIS ONLY FAULT IS THAT HE TOOK THE STAND WHILE OTHERS DIDN'T I THINK IN SLEEPY PAKISTAN HE ONLY DESERVES TO BE CRITICIZED FOR THAT!